If you'd like a name or monogram, etc, please enter that information here! This sturdy 5x7" drawstring pouch is crafted from heavy white glitter felt, fully lined with white on white cotton muslin. The drawstrings are white grosgrain ribbon. 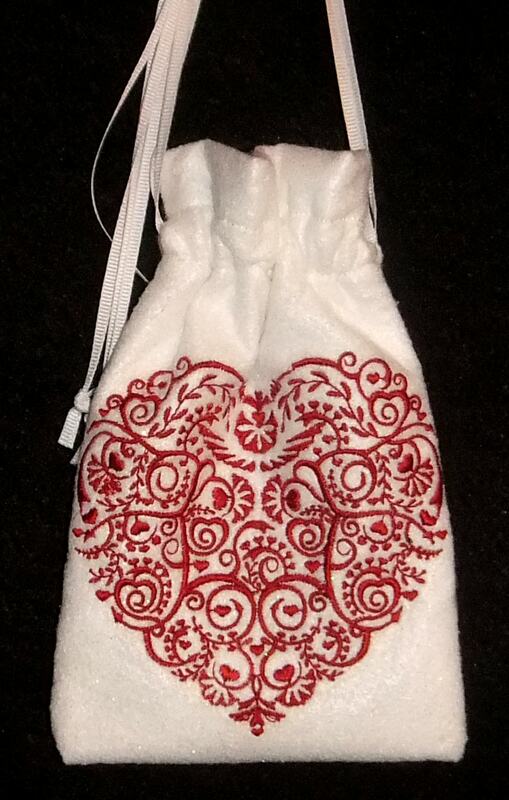 The heart embroidery on the outside front makes it a great gift idea for Valentine's Day and is composed of 18,087 stitches in 1 colorfast rayon thread. The pouch is machine washable on gentle cycle, lay flat to dry. Custom orders are also available in a very wide variety of embroidery designs, styles and sizes! Lined Drawstring Pouch with Embroidered "Death before Decaf"